When Mike and I decided to finally get married after nearly 9 years together, I was ecstatic. 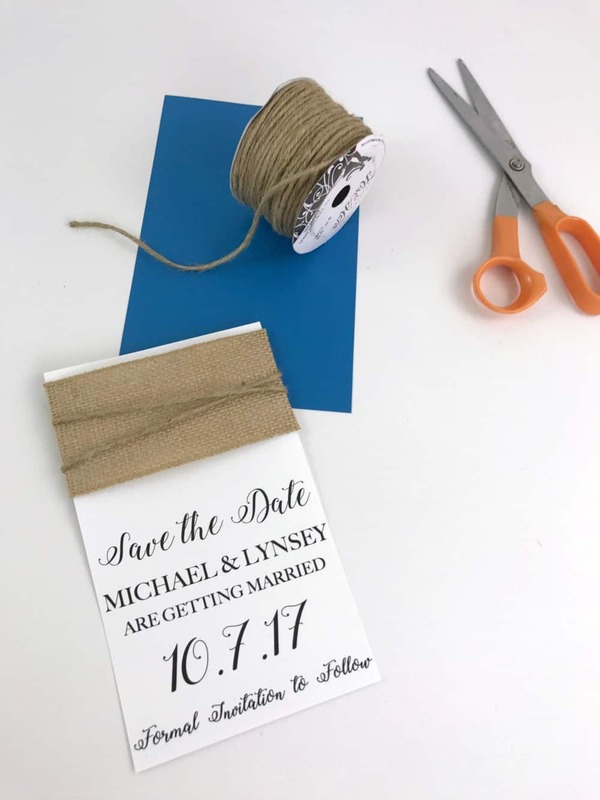 For years he and I had gone back and forth over the details of the wedding – big or small, midday or evening, beach or church, modern or traditional… we could never decide. 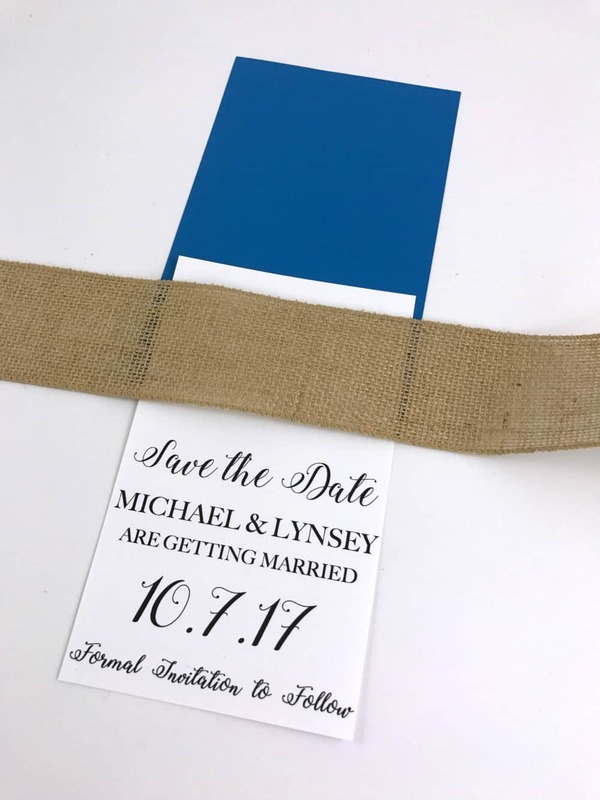 But finally one day everything just clicked, and we sat down and put together the perfect plan that brought everything I love (the beach) and everything he loves (traditional) together in one. 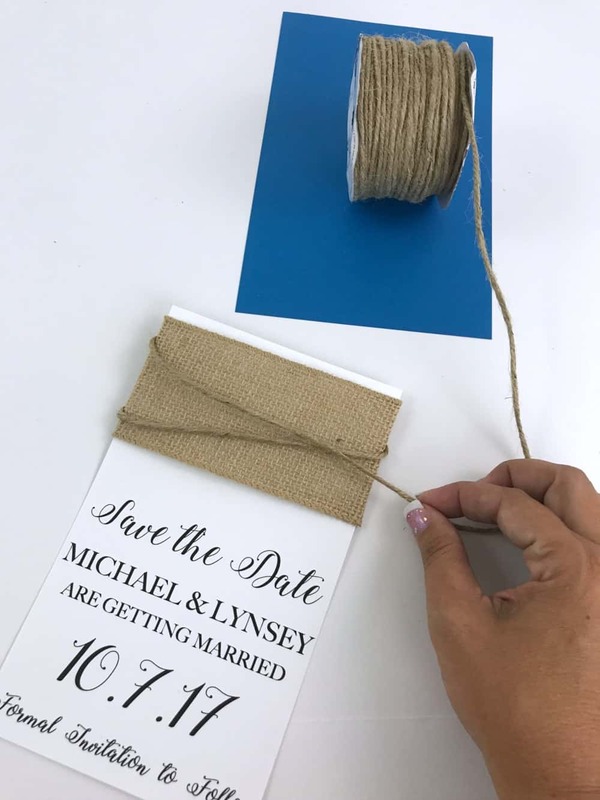 It was truly the best day of my life as we stood surrounded by our loved ones, and it all began with these DIY Beach Theme Save The Date Cards. 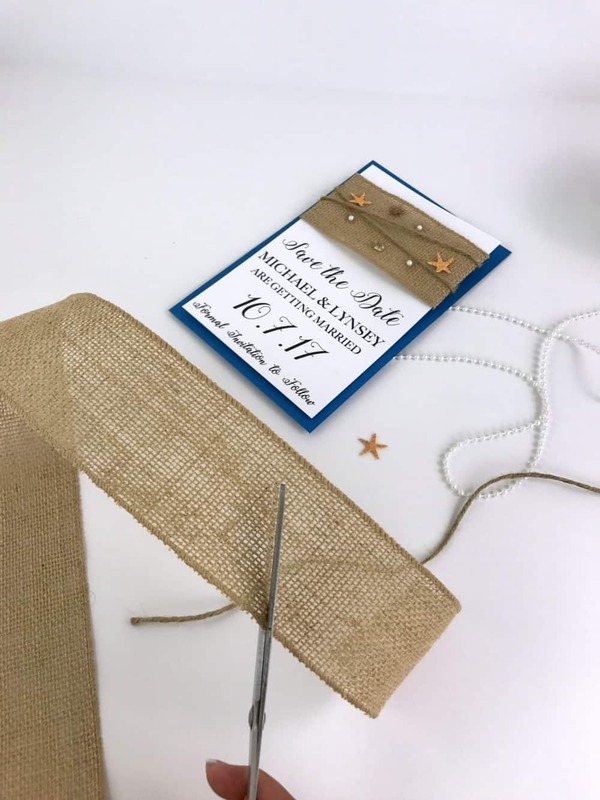 I knew after making everyone wait this long I wanted to go all out on the details of this wedding. 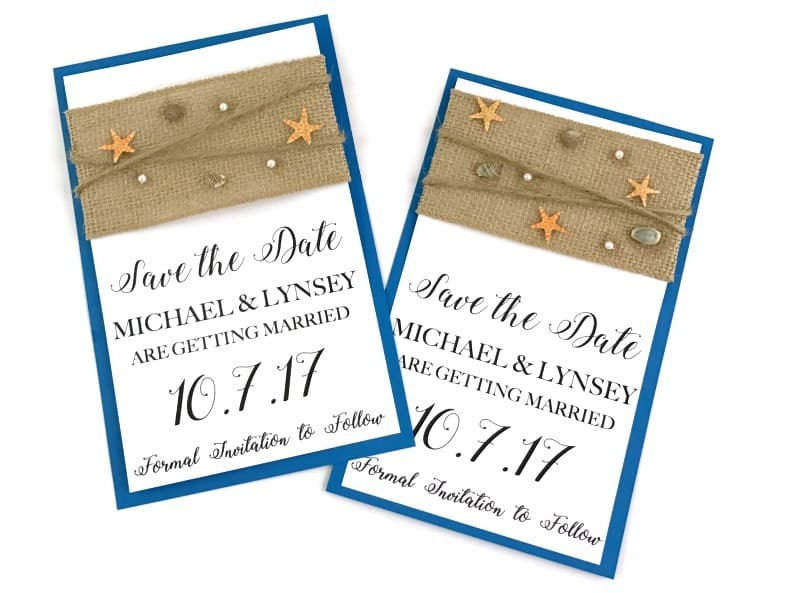 Having a Beach Themed Wedding has always been my dream. 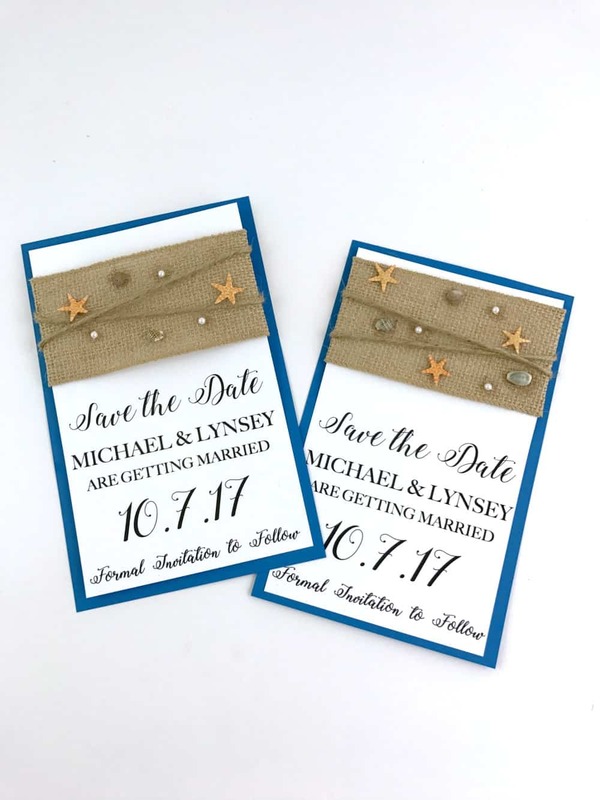 I have a deep love for all things beachy, and I wanted to incorporate it into every part of this wedding. 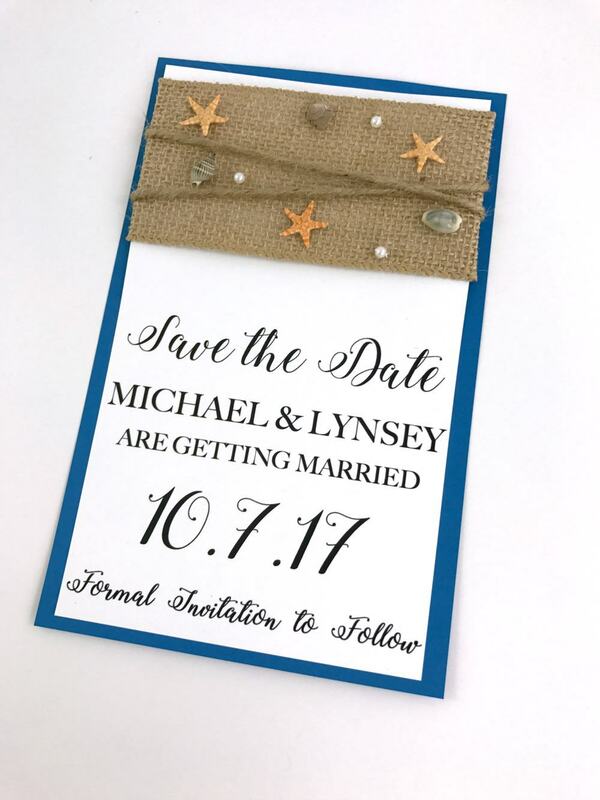 After pricing Beach Themed Wedding Invitations I just couldn’t stomach the idea of some mass produced card going out. 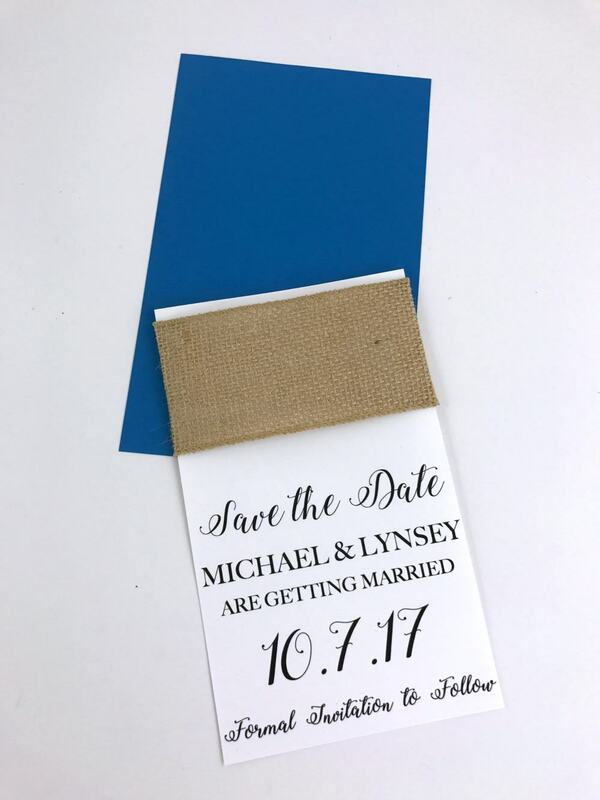 I knew it was time to get crafty and make my own… and I could not have been happier with the finished product. Assorted Seashells – I used these. 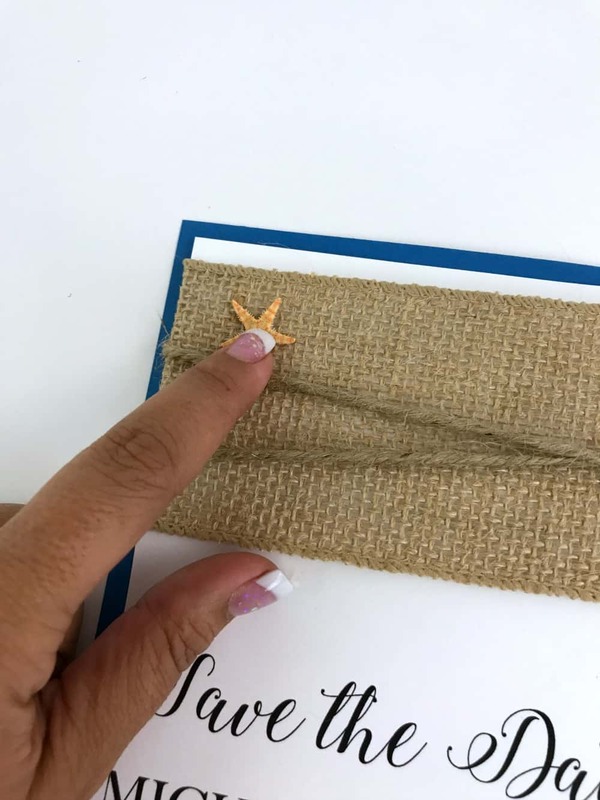 Tiny Starfish – I used these. Pearl Ribbon – I used this one. 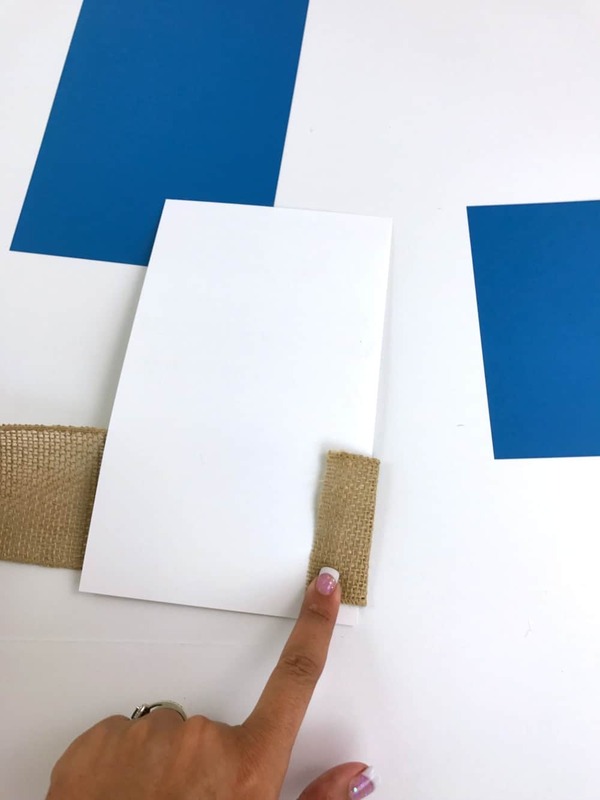 The first thing you want to do is cut your Colored Cardstock in half. This leaves you with an 8.5 tall x 5.5 wide card. 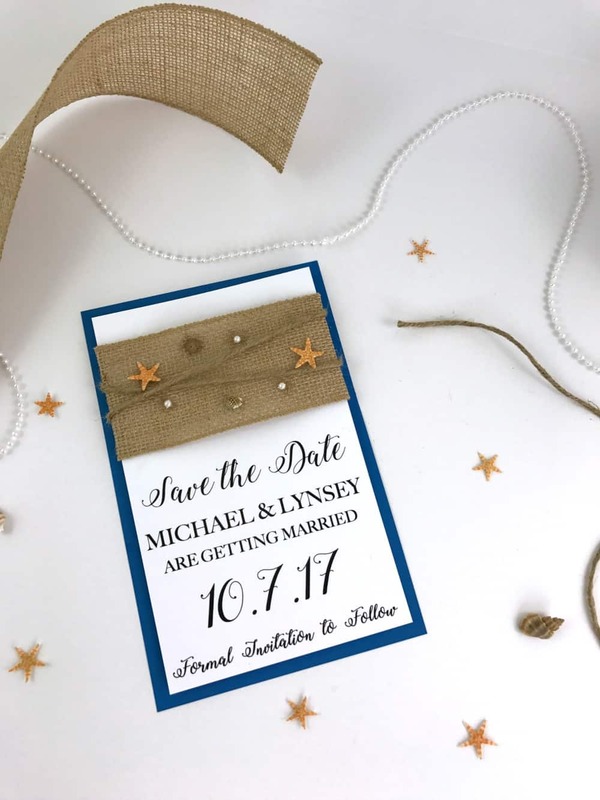 This will be the base of your save the date card. 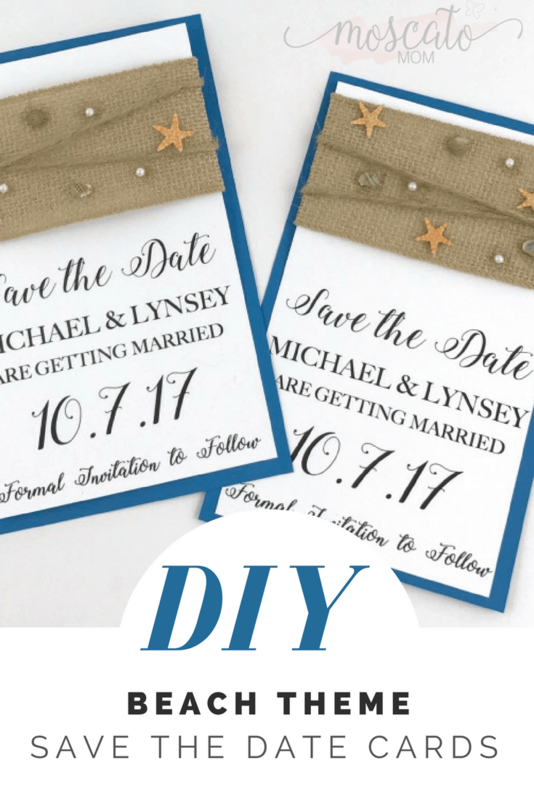 Then print out your Save The Date template on white cardstock and cut them to size. To make this easier I used an X-ACTO Plastic Base Laser Guillotine Trimmer cut out each one along the black lines of the template. 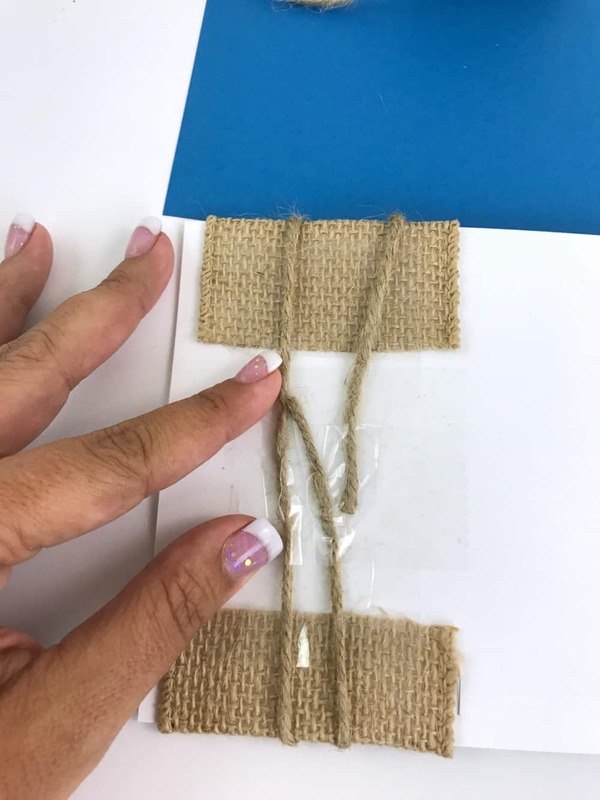 Next, line the wired burlap ribbon up to the card. 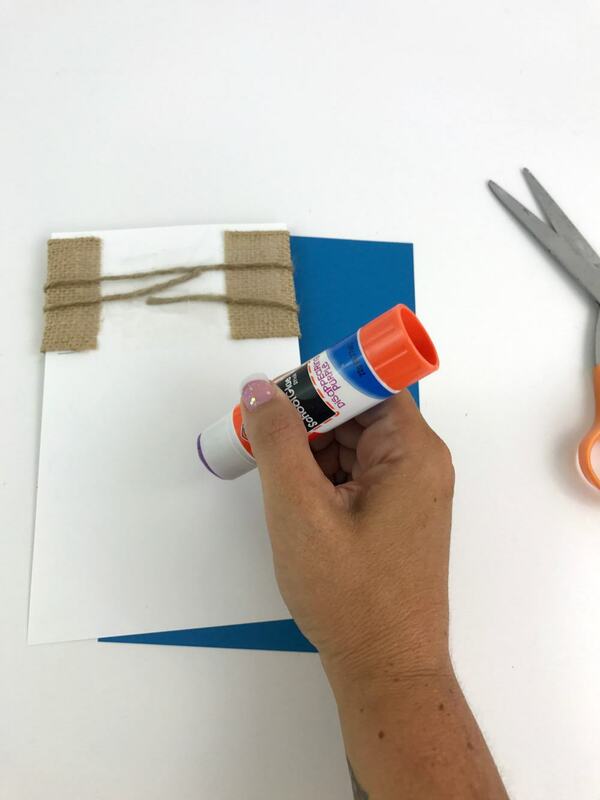 Make a small fold that wraps around the white cardstock and measures the length to securely wrap to the other side without being too tight and folds around the other side. 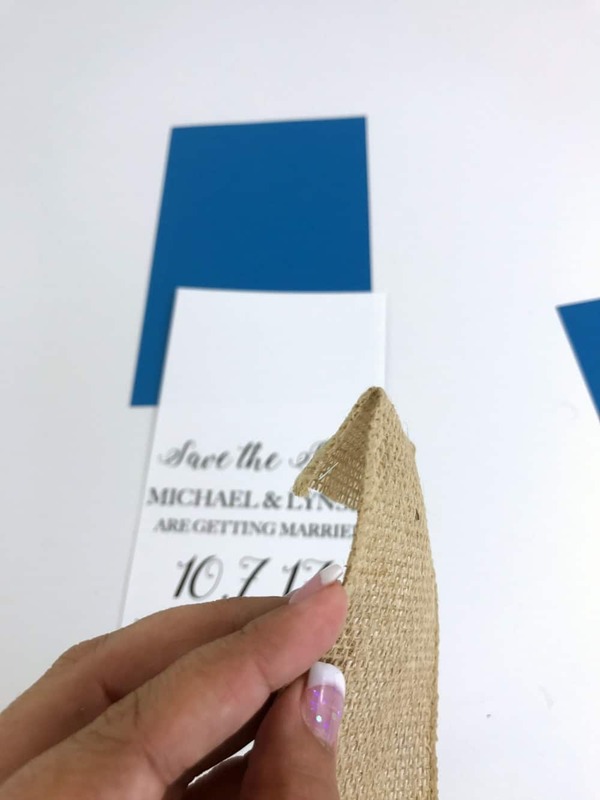 Cut the Burlap Ribbon and fold both edges around the white card. Secure with Packing Tape for a strong hold. 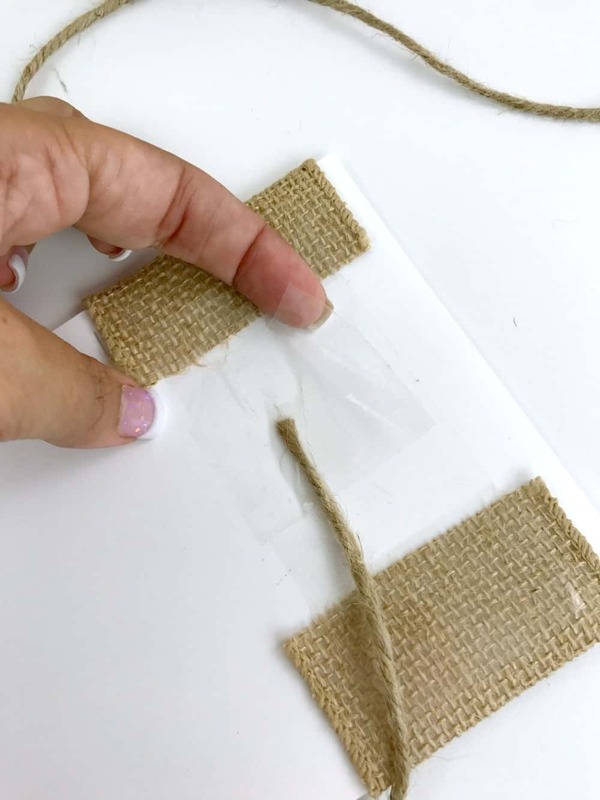 Next, put another piece of packing tape on one end of your twine and wrap gently two times around – making a criss-cross off to the side. Secure with another piece of packing tape. The next step is to affix the white card to the colored card. 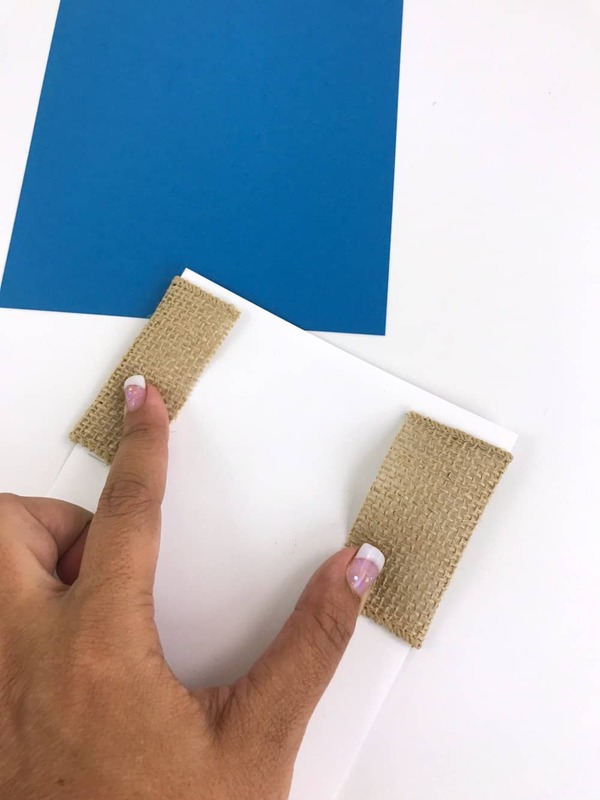 You can either use a glue stick or heavy duty double sided tape to do this – just make sure you use a lot of whichever one you choose! 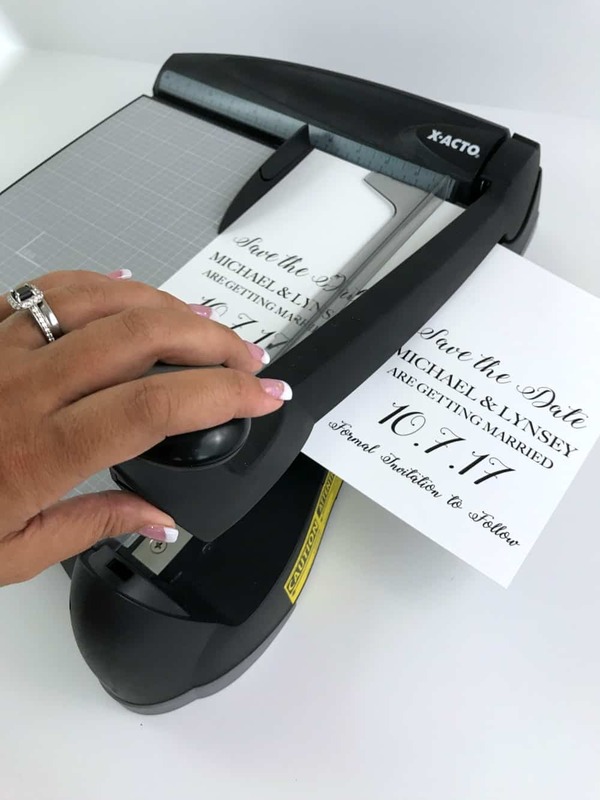 You want to make sure the two pieces of cardstock are securely stuck together. The final step is to add the seashells, starfish, and pearls to your liking. 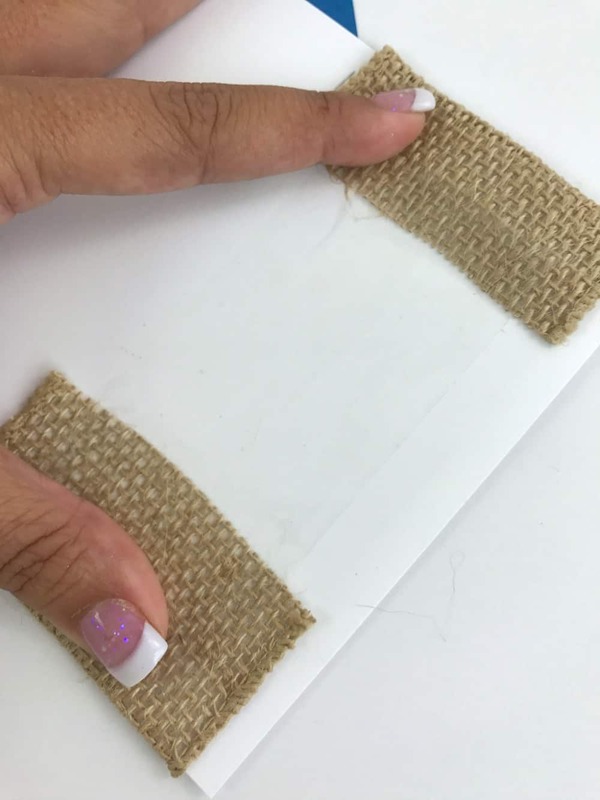 Put a dot of craft glue and then hold your embellishment securely for a few seconds to set. To ship, simply wrap in bubble wrap and place in large envelopes with a tape seal. Note: if you take them to the Post Office you can pay for postage that will be stickers instead of them running them through an automated machine. That will keep them looking nice and help to not crush the shells. I could not be more happy with how these turned out. Everyone absolutely loved them. They were simple to make and much less expensive than mass printed cards. Plus I love that each one was just a little bit different. 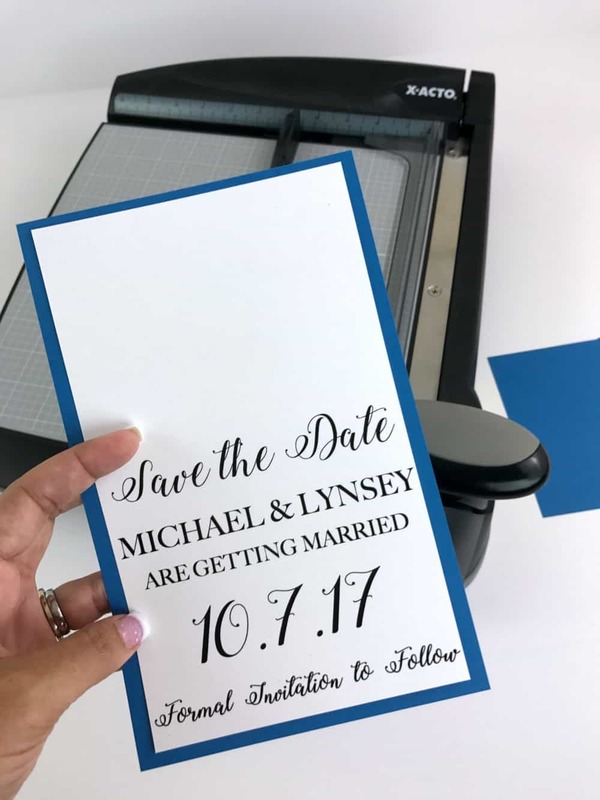 They were the perfect way to announce our perfect day.